Have you ever thought about taking up a new instrument, but thought maybe, you were a little too old to learn something so complicated? Not true. Actually, learning to play an instrument, at any age, has dozens of mental and physical benefits. Playing an instrument can actually increase your capacity to learn something new, anything! Learning to play an instrument, improves your cognitive skills and memory. 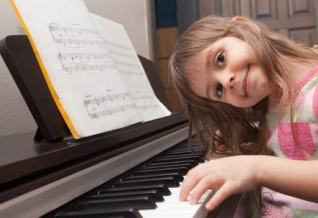 Memory centers in your brain actually become more active as you learn to read and play music! Taking up playing can even help you learn a new language. So, for those of you struggling with your Spanish lessons, consider adding piano or guitar lessons to your schedule and see how quickly your comprehension of language increases. Playing music requires you to refine your skill of differentiating specific tones and scores and that, in turn, helps when studying other languages. Learning to play an instrument involves using your hands, feet or fingers to key notes, or beat a drum. Counting measures and keeping a specific tempo increases your motor skills and coordination. With most instruments, you also have to have your fingers or limbs performing different tasks at the same time. This helps your hand-eye coordination and that could save a digit someday in the kitchen or keep you from falling when kids or pets get underfoot. Learning to play can decrease your heart rate, reduce stress, lower blood pressure and overcome depression. Maybe that’s why music is now considered a form of therapy in many countries. Exploring your creative side can also have a positive effect on your mood and self-esteem. Learning an instrument opens the doors to a whole new way of expressing your creativity. Most already know that listening to music can boost your mood. But, add that effect to all of the positive health and emotional benefits of playing your own music and you have a pretty good recipe for creating some good vibrations, on every level.